Want to put your students in the mindset that nothing is impossible? Try this quick, simple activity (the earlier in the year, the better). Print out the image below as a large banner. You'll estimate the required size after reading the rest of this post. Click here to download the full sized banner as a jpg. If you don't have a printer large enough at school, you might want to try office supply stores. Most have a service that can print paper banners. You could even tile several 8.5" x 11" sheets of paper with tape to get the job done. It needs to be printed on cheap, non-photo, non-glossy paper that is easy to write on and accepts ink (from a marker) well. If you have multiple types of paper you might want to run some quick tests with a wide tipped marker. I know what you're thinking, "The word 'impossible' really isn't something I want to emphasize in my classroom." Just bear with me a moment and you'll see where this is going. I did this at the beginning of the year, and wanted the banner to stay up throughout the year as a reminder so I hung the banner high; so high, in fact that the students had to stand on the desks to reach it. Have no fear, at Village Tech (VT) we have industrial strength desks. TIP: Depending on what type of paper you use, or how thick it is, it's probably a good idea to secure (tape, staple, whatever) a few extra layers of paper behind the first two letters, "I" and "M". Just try not to make it too obvious. One of my key points in class is to have the students consider nothing impossible. There's typically a creative solution to accomplishing just about anything -- you just have to find it. As Batman's alter ego once said, "Everything is impossible, until somebody does it." Yes, even fictional characters can share words of wisdom from time to time. We talk about Walt Disney, who was called crazy when he said he wanted to make a full length animated feature film (at a time when animated films were only a handful of minutes long.) "That would take an army of animators. ", he was told. So -- he built an army and created "Snow White". Walt would later famously say, "It's kind of fun to do the impossible." There are plenty of other individuals you could reference, Thomas Edison, John Lasseter of Pixar, the Wright brothers, illusionist David Copperfield. You can tailor this talk in whatever way best suits your class, but for the last part of the talk, I specifically call out actress Audrey Hepburn. Ms. Hepburn isn't exactly well-known for her innovative skills, or knack for doing the impossible, but she is know for a very simple, creative, observation. It's such a brilliant and simple thing to take note of, and it's a wonderful message. I ask the students, "In that quote, what part of the word are you?" To which most reply, "The I'm." It's interesting how much even a few letters can change by simply looking at them from a different point of view. Then I have each student to climb up on the desk (the desk climbing part is optional...if your desks aren't heavy duty. ), take a look around -- yes, taking tips from "Dead Poets Society" here, and have them sign their signature big and proud inside the letters "IM". They make a pledge to try to see the possibilities in things, instead of focusing on the barriers, limitations and excuses. I ask them to try to see and do things differently for the remainder of the year, not only in my class, but in every class. At first, my students were very careful about not writing over someone else's name. We have very polite students. Then, as space got crowded we had to work through the "There's no more room." phase. To which I responded, "Hmmm, well you need to sign your name in the letters somewhere." Eventually they had no choice but to sign their name above another. Once that self-imposed rule of "not writing on someone else's name" had been broken, things really went crazy. Students started signing their name up and down, backwards, in a circle. Some signed in foreign languages, like Korean and Japanese. I teach seven individual classes, and students were still finding ways of being unique. THIS was the spark I was looking for. 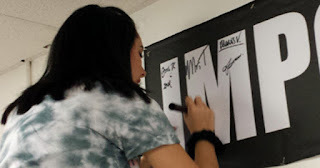 Students, looking for different ways to do even the simplest of things, like signing your name. Download the full size banner graphic here. Be sure the students understand to write their name/signature as large as they want. Some will want to break the rules and let their name overflow into the "P". I'm generally ok with this, since bending/breaking the rules is a common path to "thinking outside the box". If you ask them to do something different, I think you have to be willing to bend the rules. Just don't let it get out of hand. Be sure not to make your banner too big. Take the number of students you teach into account. Don't post a six foot banner that's a foot tall if you only teach 50 students. The "I" and the "M" need to be covered and completely filled in with all the students signing once. So you may need a really wide tipped marker to help with small class sizes. Be sure to put some extra paper layers behind the "I" and "M" so the ink doesn't bleed through and you end up marking up your wall. Keep it fun. Keep the pace moving quickly. I was able to sign all 25 students in each class in under 5 minutes. This is a super quick, super easy activity that helps put students in the right mindset of thinking and doing things differently. My banner is still hanging up for the year, where I believe it will remain until the final day. I'm not quite sure what I'm going to do with it then -- but I'm thinking it would be really cool if there was yet one more reveal or magical moment for this Impossible Banner. If you do try this out in your classroom, do me a favor and post here and let me know how it went. What types of things did your students do to stand out, be unique and think differently?